A pedestrian-prioritised €10 million plaza is planned for Dublin’s College Green. The proposed College Green Plaza looking from Trinity College. 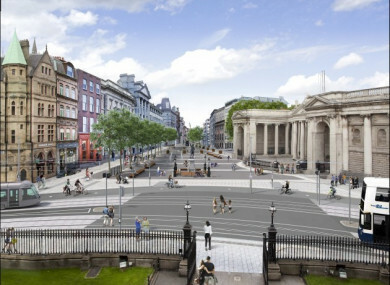 DUBLIN CITY COUNCIL is to review the implementation of traffic restrictions in Dublin’s College Green following An Bord Pleanála’s decision to cancel next week’s public hearing on the planned pedestrianised area. The public meeting was planned for next Tuesday to discuss Dublin City Council’s plans for the pedestrian-prioritised €10 million plaza at College Green. The plaza would see all traffic banned from the Dame Street and College Green area. However, An Bord Pleánala notified relative parties yesterday morning that the meeting would not go ahead. The board said that it had been postponed as a result of “reasons associated with public consultation and the EIA Directive”. A newspaper notice was issued in November specifying the commencement of a 21-day public consultation period. However, it came to An Bord Pleanála’s attention that this information was incorrect and that requirements outline that the consultation period must be 30 days. Dublin City Council’s chief executive Owen Keegan said that the council “adhered to the public consultation period advised by An Bord Pleanála”. TheJournal.ie understands that the meeting cannot be held until Dublin City Council re-issue the amended newspaper notice and allow the 30-day period to be completed. It remains unclear when this notice will be issued and when the meeting will be held. In light of the cancellation, Keegan said that the council will review the traffic management arrangements. In a letter to councillor Ciarán Cuffe, Keegan said that “the introduction of the Luas Cross City in December in advance of the elimination of the east and west traffic on College Green necessitated the introduction/continuation of certain interim city centre management arrangements”. This included a “significant” reduction in pedestrian priority at a number of city centre junctions, according to Keegan. The council will have to review the interim traffic management arrangements to determine what additional changes are required, given the need to restore pedestrian priority, to cater for longer Luas vehicles and for a higher frequency of Luas Cross City services. Dublin City Council has said that the new plaza will have the capacity to accommodate up to 15,000 people and will be fully equipped with the infrastructure required to stage later public events. It is intended that the plaza will be an “attractive tree-lined, granite-paved 7,300 square metre space, which will facilitate major public gatherings and professional events through the city”, the council said. It remains unclear when traffic plans will be changed and when work will begin on the plaza. Email “Dublin city traffic restrictions to be reviewed following delay of College Green public hearing ”. Feedback on “Dublin city traffic restrictions to be reviewed following delay of College Green public hearing ”.